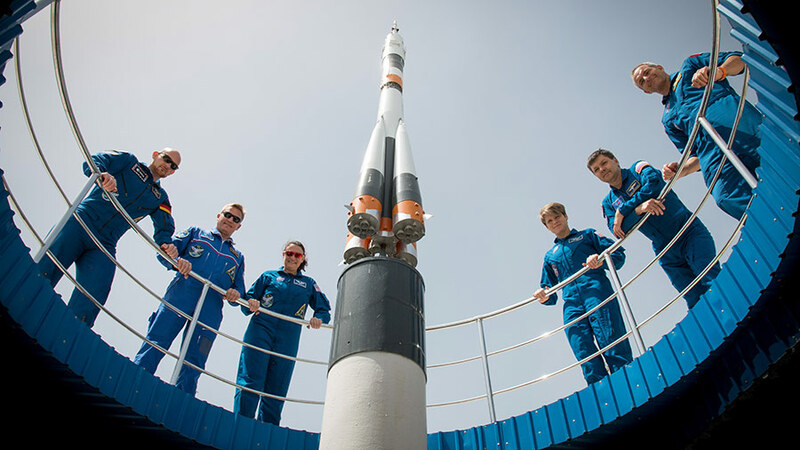 The next three crew members to launch to the space station and their backups pose for a portrait at the Cosmonaut Hotel in Baikonur, Kazakhstan. From left are Expedition 56-57 crew members Alexander Gerst, Sergei Prokopyev and Serena Auñón-Chancellor with back up crew members Anne McClain, Oleg Kononenko and David Saint-Jacques. The Expedition 55 crew is unloading the Orbital ATK Cygnus space freighter today ahead of next week’s crew swap at the International Space Station. On top of the cargo transfers and crew departure activities, the orbital residents are also running space experiments to benefit humans on Earth and astronauts in space. NASA Flight Engineer Scott Tingle has been working inside Cygnus today unpacking station hardware and research gear delivered just last week. He removed science kits and spacewalking gear and stowed them throughout the orbital lab. Tingle finally wrapped up his workday with his homebound crewmates Commander Anton Shkaplerov and Flight Engineer Norishige Kanai preparing for their June 3 return to Earth. The trio packed personal items and other gear inside the Soyuz MS-07 spacecraft that will parachute the crew to a landing in Kazakhstan after 168 days in space. Back on Earth, Soyuz MS-09 Commander Sergey Prokopyev and Flight Engineers Serena Auñón-Chancellor and Alexander Gerst are in final training in Kazakhstan ahead of their June 6 launch to the space station. The Expedition 56-57 trio will orbit Earth for two days before docking to the Rassvet module to begin a six-month stay in space. NASA astronauts Ricky Arnold and Drew Feustel, who are staying in space until Oct. 4, familiarized themselves today with the new Cold Atom Lab’s hardware and installation procedures. The device, delivered last week on Cygnus, will research what happens to atoms exposed to temperatures less than a billionth of a degree above absolute zero. The two later split up as Arnold set up thermal hardware that will help scientists understand the processes involved in semiconductor crystal growth. Feustel moved on and began uninstalling a plant biology facility, the European Modular Cultivation System (EMCS), which has finalized its research operations. The EMCS will now be readied for return to Earth aboard the next SpaceX Dragon cargo craft.